The time is now for innovation in the race to save the world’s rainforests, and where governments fail to stand in solidarity with the earth and its creatures, activists are rising to the occasion with dedication and ingenuity. In an effort to combat illegal logging in some of the most biologically diverse regions of the world, Rainforest Connection (RFCx), founded by activist Topher White, has developed a warning system which alerts locals and conservationists of immediate threats to old growth trees being targeted by illegal loggers. Using recycled cell phones, small solar panels and a custom application, RFCx has developed an easily deployable distributed network of listening devices which serves as a real-time monitoring system for the forest, uploading data to the cloud and alerting conservationists to the sounds of chainsaws. With this data, park rangers and intervention teams can immediately hone in on the location of tree poachers, often early enough to save targeted trees. The system is also being used in research and conservation programs, serving as the ears of the forests, allowing scientists to listen for certain animals or monitor the density of wildlife in a specific area, lending critical data to other conservation efforts. 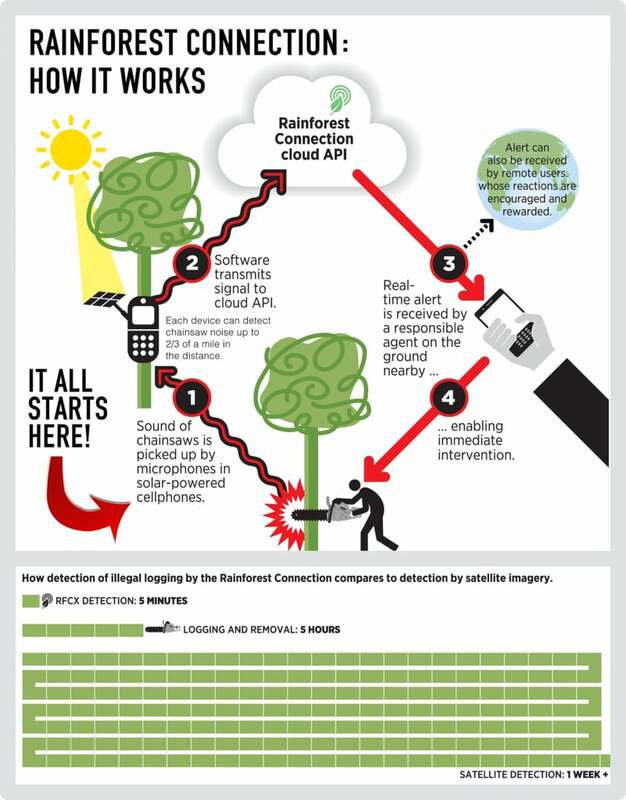 “Rainforest Connection (RFCx) transforms recycled cell-phones into autonomous, solar-powered listening devices that can monitor and pinpoint chainsaw activity at great distance. This changes the game by providing the world’s first real-time logging detection system, pinpointing deforestation activity as it occurs, and providing the data openly, freely, and immediately to anyone around the world. I learned of this inspiring endeavor from a personal friend of mine, professional tree climber James Reed of the Tree Monkey Project, who’s been involved with Rainforest Connection in Peru, Ecuador and Borneo, with upcoming plans to assist in deploying this technology in Brazil. Reed says the project is already a major win for locals who have been struggling to stop the destruction caused by loggers and wildlife poachers. Remarking on why this monitoring network is so helpful to regional tribes, Reed says, ‘their territories are too big to cover by manning them because their tribes are too small, and it’s too expensive to build a wall,’ to keep out poachers. While the efforts of small, dedicated groups of independently funded people are like David vs. Goliath against corporations and poachers, they may be the best hope we have, especially with projects like this one which multiply the capacities of locals engaged in the fight for conservation. You can help support Rainforest Connection by donating cell phones, making monetary donations and by spreading the word. Please take a moment to visit their website and their Facebook page. For a look at some of the many incredible creatures this project protects, visit their Flickr page. This article (Activists Deploying Recycled Solar Powered Cell Phones in Fight to Save Rainforests) was originally created and published by Waking Times and is published here under a Creative Commons license with attribution to Dylan Charles andWakingTimes.com. It may be re-posted freely with proper attribution, author bio, and this copyright statement.